Donate to the RBCC today. 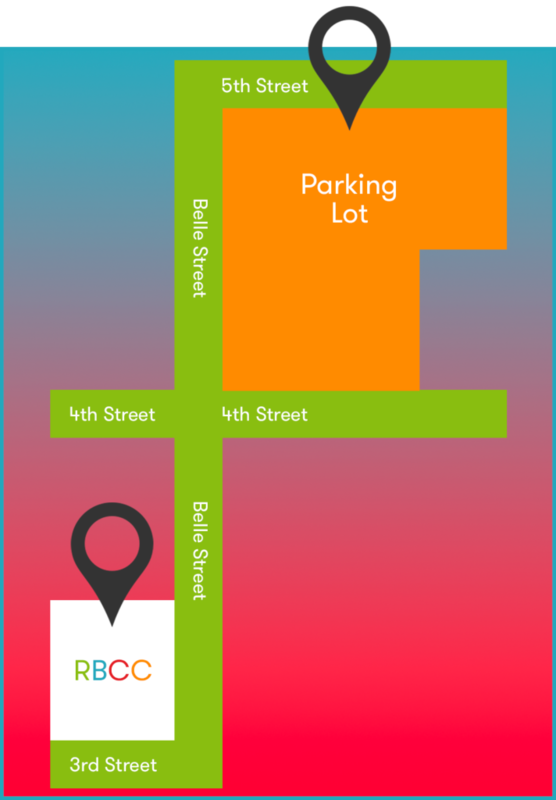 The RiverBender.com Community Center Parking Lot is conveniently located on the corner of W. 5th St. and Belle St. We prefer all patrons use this secured lot for their safety and convenience. The entrance to the parking lot is on W. 5th Street and is indicated with a white arrow. The entrance to the community center is at 200 W. 3rd St.
Use the same common sense you would anywhere. Avoid walking alone and always be aware of your surroundings. Parents drop off their middle schoolers at the front door at 200 W 3rd street. Volunteers will be outside making sure the kids get in safe, and handing out flyers with important information on them. Parents may pick up and drop off students in the front of the building until 9:45 p.m. At 9:45 p,m., students will be ushered to the back parking lot for drive-through pickup. Parents will enter our lot from State Street. At the official’s direction, the children will be released and may walk to their car. Please make sure you gather your children (and any friends) quickly as we usually have numerous kids waiting to be picked up. Once the cars have been filled, the official will release the cars to exit the lot and bring in more cars. Our goal is a fast, yet safe pickup system. We appreciate your patience. Cars will exit the lot onto the one-way section of Belle Street.